Description: From a slide collection I have. Looking as handsome as the M420's did with this scheme! With a bridge towards the back of the 2004, it looks like the slide was done at the old New Haven Northup Avenue Yard. Description: Notice Santa Claus on the locomotive steps. Description: Early days of the P&W. Description: MLW M420R No. 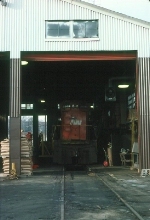 2004 is visible inside the shop. Description: P&W power and rolling stock. Shot taken from the Conrail Main. Description: The Providence and Worcester only had 2 GE's in 1984. The 1801 and 2201 seen with the 2004. Their on the bridge that spans the Blackstone River between Central Falls and Cumberland. Description: On the Providence & Worcester Railroad Norwich Branch spur to the Tripp Lumber Company Annex (to right) at Community Ave Ext in Plainfield, CT. Shoving a carload of drywall into the warehouse. Today, 2009, the property is now occupied by Strategic Recycling. Color print scan. Description: Shoving a carload of drywall into the Tripp Lumber Company Annex warehouse on the Providence & Worcester Railroad Norwich Branch at Community Ave Ext in Plainfield, CT. Today, 2009, the track the 2004 is on has been removed and the property is now the location of Strategic Recycling. Color Print scan. Description: S/b on the Norwich Branch of the Providence & Worcester Railroad. Approaching the spur to Tripp Lumber Company Anexx at Community Ave Ext in Plainfield, CT. The 2004 will shove the bulkhead flat car load of drywall into Tripp's warehouse. Today, 2009, this spur services Gro-Well and Strategic Recycling. Color print scan.